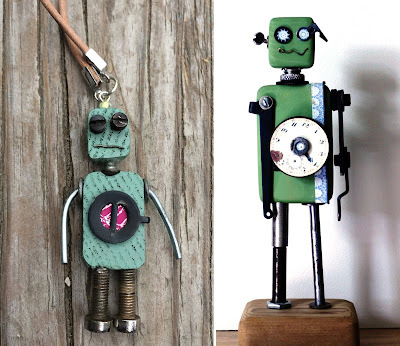 Upcycled, Forgotten Then Found Object Robots & Jewelry. 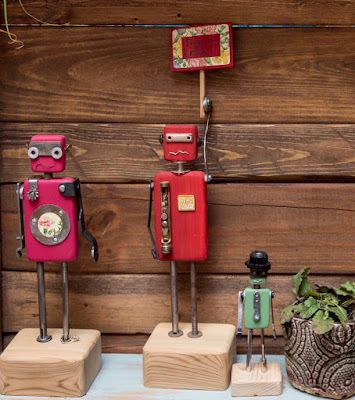 Personality Filled Little Sculptures & Accessories With New Life. Once an artist, always an artist, but not always in the same medium. Am I right? It never ceases to amaze me how many of the creatives I meet are highly skilled at tons of different techniques. While it’s smart from a business perspective to focus, I’m very impressed by artists like Jennifer Le Dissez who can pretty much do it all, like a Jack of all Art Trades, AND have a specialty that’s truly unique. Jennifer of Avel Glaz creates one-of-a-kind upcycled sculptures and jewelry from a wide assortment of objects. 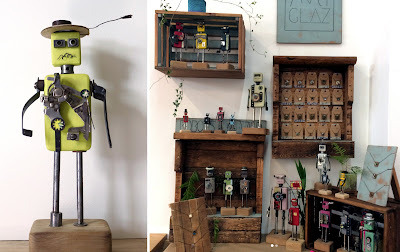 She originally studied to be a silversmith in France, but now uses those skills, and quite a few others, in her personality filled robot creations. I’m pretty sure Jennifer and I would have fun shopping together because I too love getting lost in flea markets and thrift stores finding random treasures. These odds and ends become the elements of her sculptures, mini in stature (most under a foot in height), but big on adorable appeal. Jennifer sees opportunity in broken pieces of old gadgets, and that helps inspire her creations. Reducing, recycling and reusing is good for our planet, but this style is also incredibly clever. I love how Jennifer creates so much character with the faces and accessories. If you look closely you can sometimes tell what gadget the elements came from. Some have hats or glasses and moveable arms. How playful?! Her jewelry pieces are equally fun, some also robots and others with a more modern design. I’m very impressed with Jennifer’s eye for potential and her desire to apply artistic talent to good. It's hard not to smile when you see her pieces.